I’ll unfriend anyone who liked this film. A little harsh. Some might say. But you know you’re onto a loser when everyone in the cinema is laughing. Uninspiring, unattractive and uninteresting. As soon as the crackly Universal logo started buffering across the screen, I feared the worst. So what’s this tripe about? A group of online chat room friends find themselves haunted by a mysterious, supernatural force using the account of their dead friend. We see everything through the POV of Shelley Hennig’s character Blaire and the webcams of her friends. An intriguing concept, I’ll admit. That was if we wasn’t watching a teenage girl nosing around on a Mac. The creepy YouTube video of her high school friend committing suicide certainly caught my attention and it was clever how the Facebook posts and clips filled in everything we needed to know. A malicious prank (That felt like something out of the Inbetweeners) inevitably triggers an online bullying campaign by trolls. The notion of cyber-bullying is something that needs to be addressed but this film merely uses it as a lazy ploy for a vindictive cyber-demon. What infuriated me was the lack in pace. Bearing in mind we are seeing a teenage girl, fully active in the social media age and adapted to the relentless technological gadgetry; she was incredibly slow at moving her mouse around. It was like watching my 80 year old aunt slowly clicking on each tab, killing any suspense or tension that the film failed to build up. Hennig and Moses Storm were such a vomit inducing couple. Using Skype to waste screen time and bore me with cheesy, cliched dialogue that did little to make me feel anything for them. Also an online foreplay sequence involving a knife definitely set the wrong tone for its teen audience and came off unfunny and questionable. I was praying for the troll or demon thing to make an appearance after ten minutes of listening to them whining about making Prom Night THE night and messing around with their blasted Spotify playlists. And then the Skype chat begins and I wish I walked out. The cast were terrible. Let me rephrase. The characters were terrible. Irritating, obnoxious, deluded and stupid! As soon as Jacob Wysocki bellowed through the tinny speakers, “I can see your chodies” with his face stuffed full of Cheetos, I knew I was done. The mindless chatter and desperate attempts to fuse any tension between the characters was futile. The flicking back and forth between the Skype chats and private Facebook chats was well done. It was just a shame that the conversations were so bland. However, as soon as the anonymous Skype member joined in and Blaire started receiving messages from her dead BFF, my interest was finally piqued. It was slow burning and I don’t mind that if there is a big pay off. A moment of ingenuity, suspense, shock! I had to remember that they are teenagers and some of their decisions may have been stupid but not too similar to the majority of teens out there that would do the same thing. And some of the more logical steps they do try. Deleting said dead friend off Facebook. I didn’t know how to do that. Not remove dead friends obviously. Reporting forums. Virus software if a troll has managed to get onto your server. So I will commend where credit is due. BUT the bickering. The yelling. It gave me a headache. It’s not long before secrets are leaked out on Facebook. The ridiculous demon forums with their silly chain letters. My teacher spoke to a demon last night and woke up dead. Perrrrleeeassseee. Will Peltz played the douchebag Adam well but his actions and volatile behaviour were comical. Grabbing a gun from his desk and threatening an online cyber troll through a webcam was stupid. What made it worse was that the dodgy stuff hadn’t even happened yet. This was 30 minutes in when ANONYMOUS asked to play a game. When things inevitably take a turn for the worst, there were little pockets of tension but little scares. The rule of the game being: YOU LOG OUT. YOU DIE. YOU DON’T PLAY THE GAME. YOU DIE. You get the picture. A scene in which one of the users is “punished” was just plain messed up. It surprised me. The one and only time. I thought to myself, “Okay. Going for the Saw angle. I’ll go with this”. Hand. Blender. Woah. That’s all I’m saying. BUT alas after that little shocker, we have more squealing, more yelling and more rubbish. The game was actually not that bad. BUT the little conversations away from the Skype chat soon bored me again. Blaire still believes that it is a joke set up by her BF after two messed up deaths? Come on. She keeps typing to him in a private chat and doesn’t even look at the Skype chat window to see he is not typing and completely freaking out. Then we have the shocking confessions as the friends turn against each other. The inevitable “Who leaked the video?” that caused so-and-so’s death? The reveal being utterly predictable and disappointing. And what do you know? They weren’t such good friends after all. After failing to deliver scares, it went for plain stupidity. Using Chat Roulette to call for help. Seriously? Lordy lord. It got the biggest laugh out of the film. Now if this was a comedy, it would have been great. BUT in a film that promised Paranormal Activity meets Cyberbully, it was devastating. A girl in tears asking two stoners to call the police because her friend is being killed by something she doesn’t know. Unbelievable. If you want a nail biting, tension setting thriller that deals with the true horror of online cyber bullying, please watch the superior Channel 4 drama Cyberbully with Maisie Williams from Game of Thrones. 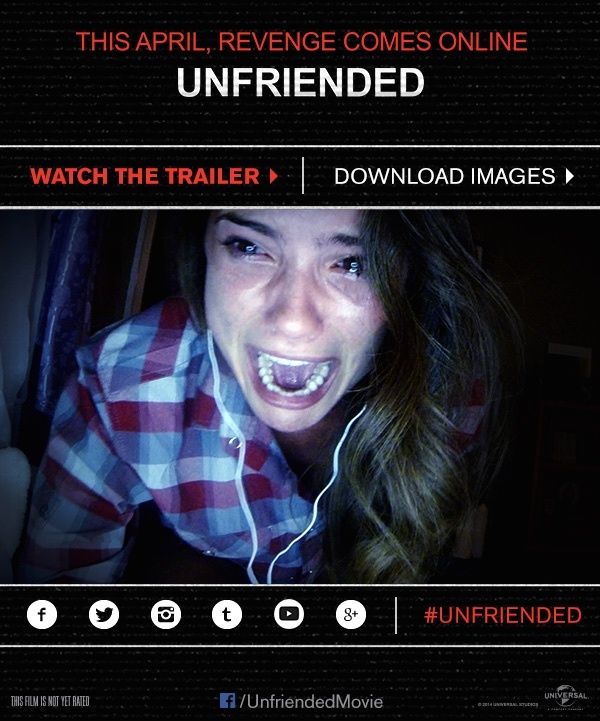 It was also brought to my attention by fellow blogger MOVIEBLORT that Unfriended stole the premise of a smaller (and better) horror film, The Den. That’s the most shocking twist of it all. The finale finally got going as me and my friends were getting ready to go. I thought maybe we will break out of the POV when the demon appears? Oh for a only brief – TRANSMISSION ENDED. As I watched, the more it blowed. Now childish sulky comments aside. Another found footage “horror” film graces the big screen with cheap scares, poorly acted, badly written characters and a laughable premise. I’ve said it before and I’ll say it again, the found footage film genre has died a death. MAKE IT STOP! The Blair Witch Project brought something new to the horror genre. Over-hyped to the max but suspenseful and tense. Paranormal Activity resurrected that format and made it a hit yet again. But surely movie producers must have realized by the endless sequels that followed from Paranormal that the format was being milked dry. Look, I’m an old school horror nut. The Shining, The Exorcist, Psycho managed to haunt me. While these feeble attempts at “horror” if you can call it that, on the other hand, are laughable. Well, I can laugh. It doesn’t cost me anything but at 10 quid a ticket, it’s not good enough. From the opening shaky handheld selfie shot, I could feel my head shaking. Here we go. Our posh toff archaeologist Scarlett (Perdita Weeks – Channel 4’s The Promise) explaining everything she is doing, killing all mystery and suspense. The opening sequence was pacey but the camera work was that shaky and erratic, I couldn’t see what was going on. It was giving me a headache . . . and the camera work as well. The jumpy moments merely equating to loud bangs and screams to make sure the audience are still awake after mind numbing exposition. It all felt like a ridiculous Indiana Jones crusade. The Mummy through the eyes of Omid Djalili with the scarab beetle in his head. That is how frantic the camera work was. I never heard so many horror movie cliches in one opening scene; “Let’s split up”, “I have a family”, “I must complete my fathers work”, oh and the infamous “Don’t go in there”. It was certainly different with an Iranian cave demolition chase but as the film slowed down (boy did it), we are subjected to none other but a quest for the Philosopher’s Stone. No, you read that right. You’re a wizard, Scarlett. A boring fable on Nicholas Flamel dragged the film further and further. Did they not watch or read Harry Potter? You could have nicked a quick synopsis and got to the catacombs so much quicker. I could feel my eyes drooping. Our lead heroine waffles on about degrees and Egyptology waffle. Credit where’s it due; the cast do their utmost to try and make it interesting but my word . . . Dull. Ben Feldman. Why would you leave Mad Men for this? Your first film post Mad Men and it’s this? A cliched character with a “dark past” spewing cliched tripe with an inevitable and corny romance brewing him and Scarlett. It was all so tedious. I thought I was watching a straight to DVD sequel of National Treasure. All the historical mumbo jumbo was there. There was one cool but highly ridiculous trick involving a tablet, cleaning fluid and a lighter. We need ammonia. Conveniently while breaking into a church, the janitor has left all the chemicals and lighters your heart could contend. Brilliant! When we finally get into the catacombs (after 40 minutes), there are moments but that is being generous. When the camera man gets trapped in a tight crevice (Come on, we’re better than that), it was done quite well as he struggles and wrestles through a passage decorated with bones. For any claustrophobic, a nightmare scenario. But unfortunately, I’m not claustrophobic. There is no tension. Random characters get bumped off left, right and centre without any background, interest or concern. Suspense. Naff all. Loud noises and screams may make me jump out of my seat but what do you expect when the story has put me into a coma, near enough. Feldman’s character with a dark past who constantly keeps reiterating that he will not go down into the catacombs; inevitably gets pushed down into the cave and what is his big secret? He’s CLAUSTROPHOBIC! Why didn’t he say that in the first place? Idiot. Oh my God, it felt like something out of a comedy sketch. The final 15 minutes certainly took it up a notch with a mad dash for survival but it felt like a terrible mish-mesh of the Death figure from Ingmar Bergman’s The Seventh Seal wafting around and brooding in a chair, demented statues that were ripped off from the Doctor Who angels popping out of no where and the frenetic first person POV (that was brought back and done so much better in REC and REC 2) rearing its ugly head in an act of desperation to keep us hanging on the end of our seats. For me, I was already on the end of my seat getting ready to leave. This only made me want to watch The Descent. A film that I felt at the time was incredibly flat and over-hyped but in comparison to this monstrosity, at least that succeeded in suspense and real scares. 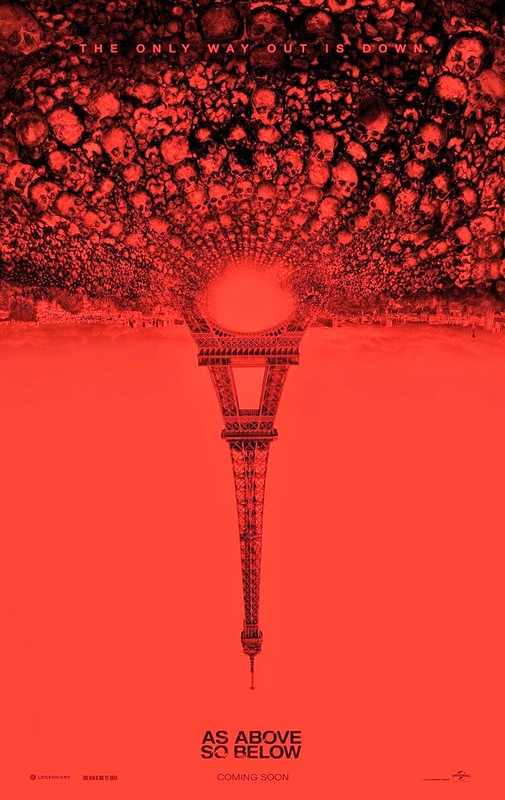 The ending of As Above So Below was a surprise. But it only established how ridiculous and stupid this film really was. If you are after a claustrophobic cave horror film, invest in The Descent. Hell even the second one. Just not this. Another big, dumb, needless blockbuster on a piece of history. However, that being said, the town has become a major site for tourism so . . . Moving on. BUT despite it’s cliche-ridden by the numbers plot line and generic characters; the visual effects were outstanding, the 3D a worthy investment and I was kept entertained for the next 105 minutes. Let’s be honest, Paul W S Anderson’s past efforts have hardly been groundbreaking (The Resident Evil franchise, Alien Versus Predator, The Three Musketeers). Pompeii is certainly one of his most ambitious efforts. Visual imagery, special effects and action have always been his forte but he would always spoil it with naff characters, ridiculous plot holes and boring predictable story lines. 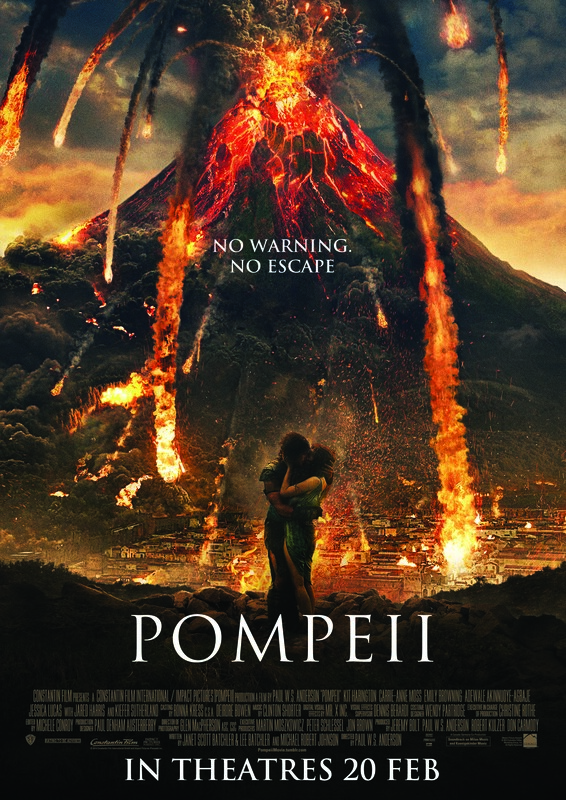 Pompeii, like it’s aftermath, is a bit of a mess BUT a watchable one. Arise, Jon Snow (no, not the Channel 4 news anchor) I mean – Kit Harington (Game of Thrones), an ever rising star. Harington proves yet again to be a strong, likeable lead. Granted, his character is pretty much Jon Snow in gladiator mode but it still works. He has enough charisma and sultry sulking to keep everybody happy. And if his body was really that toned, then I need to hit the gym. Pompeii is pretty much about a volcano. You don’t say? A slave-turned-gladiator finds himself in a race against time to save his true love, who has been betrothed to a corrupt Roman Senator. BUT as Mount Vesuvius erupts, he must fight to save his beloved as Pompeii crumbles around him. O-err! The opening zips along quite well even if it skimmed through the predictable cliched Gladiator/Spartacus/Conan plot lines. BUT it quickly set up who was who and got the ball rolling. Harington’s back story was lazy. Northern Britannia? Really? Londinium? (Oh wait. That was actually called that). The 3D doesn’t jump out the screen at you but it certainly makes everything so much more prominent. The trees and houses really force their presence on the screen. We are soon thrown into the picturesque Pompeii where Milo (Harington) falls for the (already spoken for) Cassia (Emily Browning – Sucker Punch/The Host). Browning and Harington convey enough chemistry to make the laughable corniness of their inevitable romance watchable. The whole horse thing in order for them to meet was unbelievably cheesy. Jon Snow. Gladiator and part time horse whisperer. Brilliant. I must commend the supporting cast for managing to make such stocky characters memorable. I can’t believe that Jack Bauer – I mean Kiefer Sutherland was in this as Corvus. He has enough panto menace to make a vicious villain. BUT his mish-mesh accent had me in stitches. Fair play to Jack for giving it a crack though. This was worth seeing alone for the Bauer blade off with Jon Snow. A nerdgasm for any TV addict. Adewale Akinnouye-Agbaje was very good as Atticus; a retiring gladiator on the verge of winning his freedom. He works well with Harington and they make a decent duo. To be honest for all the cheesiness, you do end up rooting for the chaps. Jared Harris (Mad Men) and Carrie Anne Moss (The Matrix franchise) were wasted in this. They do their best to portray the conflicted parents torn between honouring their civic duty and protecting their daughter from the lechy Corvus. For the Matrix fans, poor Trinity suffers a demise that may look a little too familiar. Yes, really. Had me in stitches too. The lovely Jessica Lucas (That Awkward Moment/Melrose Place) tragically played a stocky sidekick. Shame. BUT cudos to Sasha Roiz (Grimm) who managed to provide a manic minion to Sutherland’s sinister senator. The problem for me is that when you’ve had films like Gladiator and Spartacus (not to mention the excellent TV series), you can’t help but feel that there isn’t much else to offer in plot. It’s all been done before. If you love those sort of films regardless and demand another, then here we are. It’s action packed and once the vociferous volcano finally erupts. It was incredible to watch but my God, everything gets thrown out of the window that it was verging on parodical! People running around and getting bopped on the heads with flying rocks should have terrifying. Instead, it was bloody hilarious! And what infuriated me was after this mad dash of a fierce finale, it ends so abruptly and flat that I could feel my temper rising like the lavary ooze of Vesuvius. So . . . in conclusion, it’s not as bad as you think but certainly not that great either. If you go in with an open mind, you may come out pleasantly surprised but if you’re expecting a Gladiator, then go watch . . . Gladiator. Also as a side note for the LOST fans when Mr Eko saw that black smoke coming out of Vesuvius. 😉 Yeah, you know.